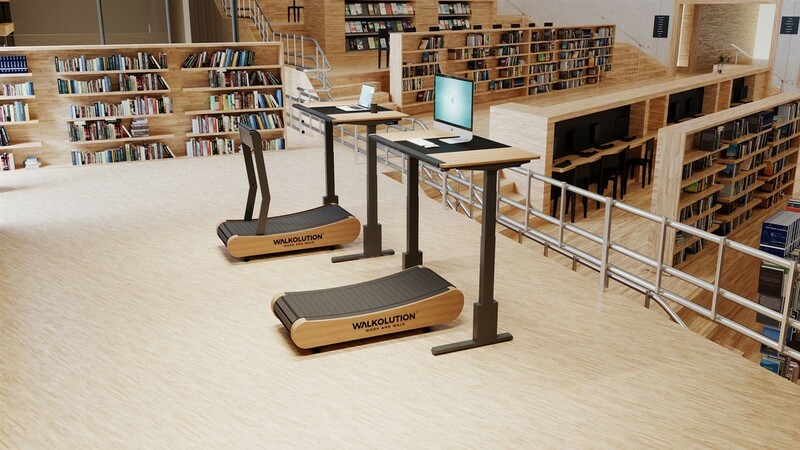 As part of the Smart Moving competition for more exercise on the university campus, the universities of Regensburg and Bayreuth are introducing a healthy alternative to chairs in their libraries. The winners of the competition will receive an active walking workstation from Walkolution for a completely new learning experience. The University Library is a place where high performance and perseverance are required. But it is precisely here that we sabotage ourselves by sitting in our chairs for hours and hours, often inactively, thereby causing considerable damage to our bodies and minds in the long run. The fact that one gets the best ideas when walking is known at least since the walking meetings that became famous through Steve Jobs, Barack Obama and Mark Zuckerberg. Abraham Lincoln and Winston Churchill also didn’t keep it in the chair for long during mental work. Learning in the library requires not only concentration, but also energy and stamina. Here, an emphasis on light physical activity, especially during learning, can make the difference. Walkolution has developed a comprehensive and scientifically based workplace concept in order to enable active work in an acceptable way that can also be permanently implemented in everyday life. This allows to work concentrated and at the same time to walk slowly on a non-motorized treadmill at a height-adjustable desk. The special feature of the patented system is that the user can intuitively adjust the speed with every step. In addition, a leaning support and a seat module enable a situational change between the different body positions. Another decisive factor for use in a quiet atmosphere such as a university library is that the system is completely silent and does not disturb or distract the user or those present. The compact active workstation is mobile, requires no more space than a conventional table with chair and blends seamlessly into the library environment with its elegant and modern design. A healthy body is known to be the basis for a healthy mind. It has been scientifically proven that active learning environments promote not only the performance, creativity and satisfaction of learners, but also their long-term health. Overall, concepts that reduce physical inactivity not only help prevent back pain in the long run, but also reduce the risk of civilization diseases such as obesity, cardiovascular disease, type 2 diabetes, tumors and dementia.